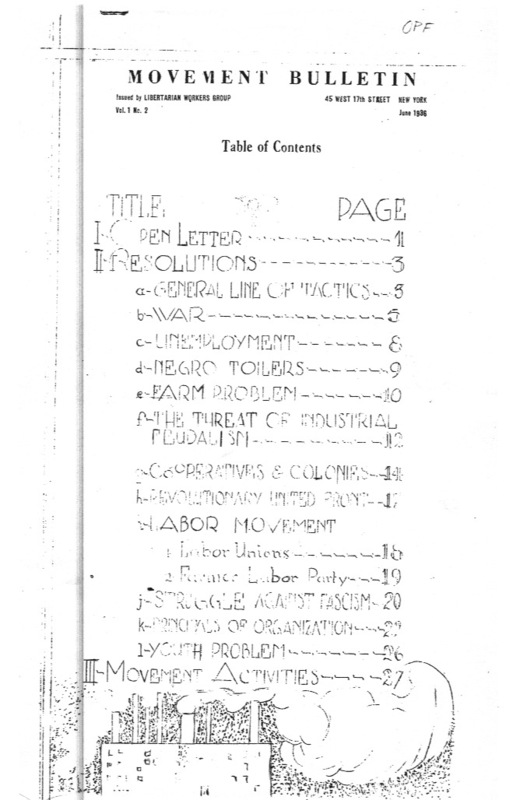 Online archive of the "Movement Bulletin" published from 1936 by the 1930s Libertarian Workers Group, not to be confused by a group of the same name formed in the 1970s. This 1936 "Movement Bulletin" was issued by the Libertarian Workers Group. The 1930s LWG was unknown to those young comrades who formed an LWG of their own in 1978. It was not until a year or two after the 1970s LWG was formed did they learn of the 1930s LWG. It is unclear who the membership were or how many members the LWG consisted of. This scribe has seen group mentioned a times elsewhere, nothing definitive. One can speculate they were no more than a dozen or twenty the most. I tend to think on the lower side. The 1930s LWG described it politics as "anarchist-communist", almost platformist and libertarian communist in some ways. In fact, the term libertarian communist is used within the body of the text. And a read of their thesis and rhetoric indicate a leaning in this direction. "By 'Movement'" wrote the LWG, "we refer only to the Anarchist Communist Movement that ... who accept the tenets and principles of Anarchist Communism as their basic philosophy and starting point from which to attack current social problems and pursue suitable tactics and program befitting the current scene. ... In other words we must try to achieve Unity of Action. We must have a common program and we must try to work out more or less similar tactics, varying in degree to reflect local conditions...."
Their position concerning the workers movement and the IWW seems to trend with a majority of 1930s NYC libertarian movement, though clearly not exclusively. The LWG "policy working among workers already organized in the AFL does not signify that we advocate the organization of new unions into the AF of L Wherever possible we would organize new workers outside of the AF of L and keep the outside of the federation. In this respect we would try and build up the I.W.W. as by far the preferred national organization in this country." The Group many engaged in propaganda, educational and solidarity work. Was there meant to be a PDF or something attached to this? Syndicalist, this wasn't from when you were a kid? Nah, I was already a mature adult by then.